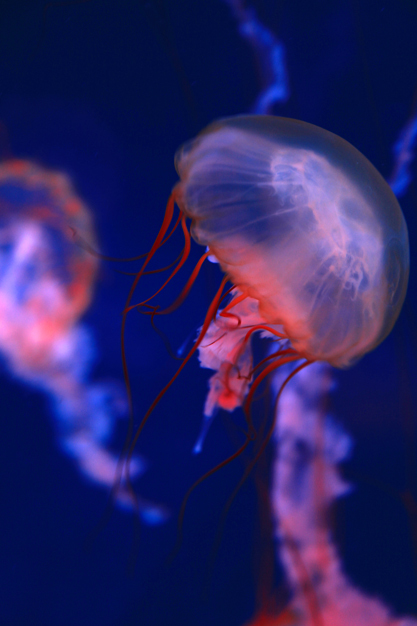 Contrary to my current situation in one sense and similar in another, the jellyfish in my series FLOW are free to float around, yet only within their own tank. This ironic comparison led me to re-visit the images in my popular Series with two images that have not previously been posted. My jellyfish portraits are usually created of some variety of Nettle Jellyfish. The Atlantic Sea Nettle (Chrysaora quinquecirrha) inhabits tropical and subtropical parts of the Atlantic and Indo-Pacific and are often seen along the East Coast of the U.S. The Pacific Sea Nettle (Chrysaora fuscescens) is commonly located along the coasts of California and Oregon, but also can be found in the waters north to the Gulf of Alaska, west to the seas around Japan and south to the Baja Peninsula. These jellyfish, an example of which can be seen in the top image, consist of a bell with long tentacles reaching down. 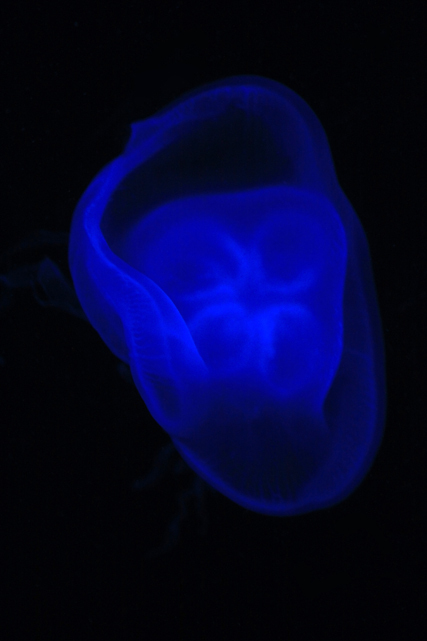 The second, wholly distinct family of jellyfish included in my series, is the Moon Jellyfish (Aurelia aurita). As seen above, it exhibits a more malleable, saucer shaped body, with small tentacles reaching down, All of the jellies in my series are photographed with the existing aquarium light, whether white or colored, in order to catch the illumination of these luminescent creatures as each of them… FLOW around their tanks. Hopefully, prints of these images as well as others, will continue to travel around the world, even if I can’t make it there myself.